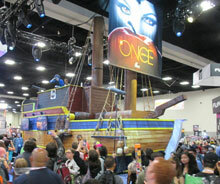 We continue the story of Comic-Con in pictures with our Saturday photos. See also Part 5, Part 7, and Part 8; Part 9 for Sunday. Or go back to Part 1. A mermaid with ink, at the Fangoria booth. Back in the old days, big-time exhibitors used to bring cars, but now that's so 2008. This year, it was ships. 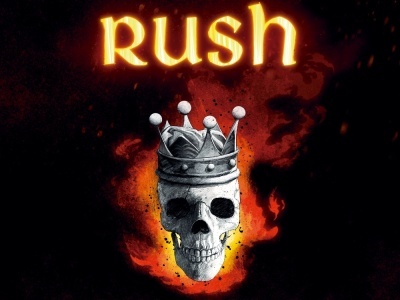 Here's one promoting ABC's Once Upon a Time. 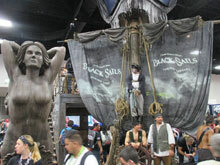 Another ship, this one for Black Sails, a new series premiering on Starz in January. 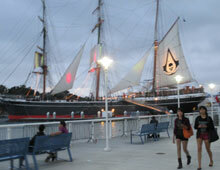 And this one, behind the Convention Center, was the long ship promoting Assassin's Creed IV in various ways, including firing a cannon several times a day. One time Miss America Lee Meriwether, who played Catwoman in the 1966 Batman movie. 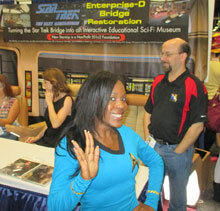 The booth for the new Enterprise-D Bridge Restoration non-profit organization, which seeks to turn the bridge into "an interactive educational sci-fi museum." 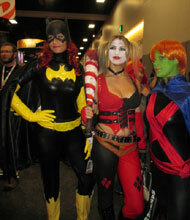 Batgirl, Harley Quinn, and Miss Martian, a major trio. 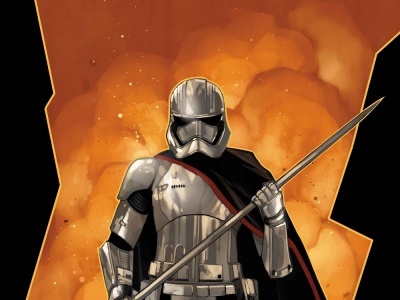 The organization that runs San Diego Comic-Con has become more sophisticated over the years at finding more sponsorship opportunities to sell. Here, the sign for the bathroom sponsorship by A&E show Bates Motel. A female Boba Fett, taking a time-out to pose. BANG! Harley Quinn has a gun. Another "only at Comic-Con" moment: Superman interviewed by ("classic") Lara Croft. Bandai gave high visibility to Power Rangers with statuary (here) and costumed characters. 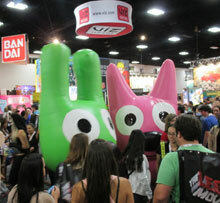 Hoops and Yoyo were mobbed. 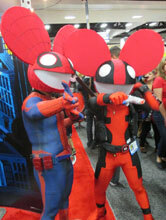 Deadmau5 Spider-Man and Deadmau5 Deadpool! 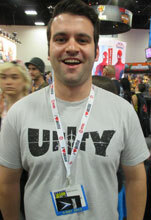 Valiant marketing maven Hunter Gorinson wearing his colors for the "Road to Unity," event.